As American health care and diagnostic technologies advance, treatments for many diseases are being offered at earlier stages than ever before. Of course, this benefits everyone involved in the patients' well-being. Overall knowledge of the condition brings an understanding to family members, but it also means they have to face it. A caregiver's main concern in these difficult cases is long-term assistance and pain remedies. 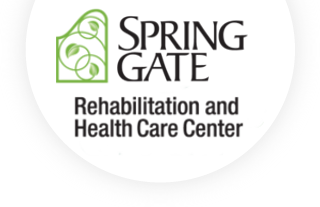 Spring Gate Rehabilitation and Healthcare Center's palliative care has the answer to families' most fear-filled questions. Our trademark heart and honest talks are at the center of all we do. There are case studies on cancer, MS, COPD, and dialysis patients that prove the benefits when palliative care joins the treatment program that is already in effect. Palliative care is not exclusive to those conditions; they were just chosen as examples. The onset of advanced symptoms in a disease is slowed down due to increased pain relief. And, as the mindset of the patient improves, his or her overall health does, too. One creates the other. It's our motto here at Spring Gate Rehabilitation and Healthcare Center, and it shows in every aspect of care we give.